Passed away Febuary 8, 2019, peacefully, at Greenisland House, Carrickfergus, dearly-beloved husband of the late June, loving father, grandfather and great-grandfather, also a loving brother of Gerdaline, brother-in-law Brian and Babes in Bangor. Funeral Service at Roselawn Crematorium on Wednesday at 12 noon. 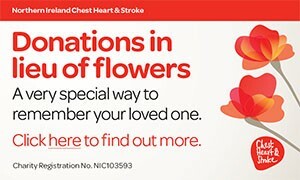 Donations in lieu, of flowers, if desired to Help the Heroes, c/o S&J Irvines, 31-35 Irish Quarter South Carrickfergus. Will be sadly missed by his loving family circle. holds memories that will last forever. I am sorry to tell you that James HARRISON has passed away.